Age: It went live on August 30th 2001, making it over 16 years, 7 months old. 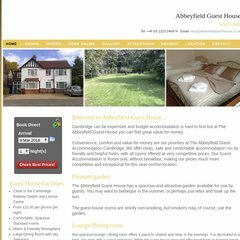 abbeyfieldguesthouse.c.. About Abbeyfield Guest House, Cambridge - Welcome to the ..
Precedence Technologies Ltd (England, Cambridge) is the location of the Apache/2 server. Its IP Number is 193.82.124.104. PING www. (193.82.124.104) 56(84) bytes of data.